Offering you a complete choice of products which include comminuting mill, rapid mixer granulating machines, oscillating granulating machines and wet granulating machines. Output 25-300 Kgs. / Hr. Electrical Motor 5.5 KW / 7.5 HP / 1440 RPM / 3 Ph. Mastech Machinery is one of the celebrated manufacturers, exporters and suppliers of Comminuting Mill that is widely demanded in chemical and pharmaceutical industries. 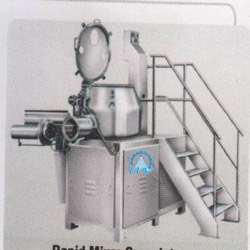 Manufactured in compliance with the preset industry standards, the proffered batch of granulators is vastly appreciated. Dry granulators are provided in tamper proof packaging to prevent damages during transportation. 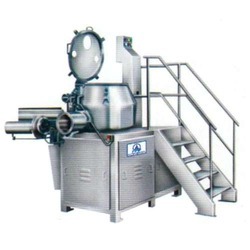 GMP point of view machine is provided with S. S. cladding on base, S. S. belt guards, S. S. cover on motor. No exposed painted surface on top of the machine. Motor rails, screw and guide rods are chrome plated. Very less down time as only beaters assembly will have to be reversed (and not the complete chamber) for making it knife to impact forward or vice-versa which can be done by single operator. Beaters and shaft are of stainless steel 410 quality and beaters are further hardened and chrome plated. Beaters are fitted on a splined shaft. Transmission of heat to the chamber from bearings is minimum as they are away in separate pillow blocks. This facilitates to some extent in processing of heat sensitive products. Castors provided for mobility and breaks can be applied for fixing machine at one place. Beaters assembly is dynamically balanced which reduce vibration and noise level and increases bearings life. 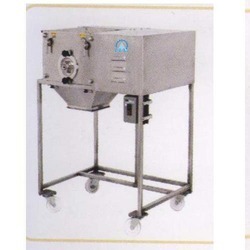 Machine is available in plain & water-jacketed models. Flame proof electricals can be provided on demand at extra cost. Rapid Mixer Granulating Machines is manufactured, exported and supplied by us is provided in various capacities and weights. 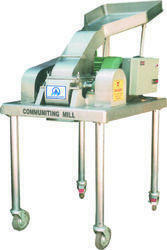 Optimum quality raw materials procured from our reliable vendors are sued for manufacturing these machines. These efficient and high durability machines are massively popular for their tough construction, longer operational life and minimal maintenance. Output 30 to 200 Kgs./Hr. Our organization is one of the most reliable manufacturer and supplier of Oscillating Granulating Machines. This products is designed and manufactured using supreme quality raw material in compliance with set industry standards. Owing to this, the range is widely appreciated by the clients. We are one of the prominent names of the market that engages in proffering Wet Granulating Machines that is manufactured in compliance with the preset industry norms. These efficient machines are extensively popular for their operational fluency, longer operational life and minimal maintenance. Wet granulators offered by us are examined for their functionality before handing over to the clients. Being the leaders in the industry, we offer Rapid Mixer Granulating Machines to our broad client base. Offered range are manufactured using high-grade raw material and advanced technology to ensure their adherence with international standards and norms. We make sure to make our products absolutely resistant to corrosion and hence are preferred by our eminent clients.